Bees are always welcome in my garden for their wonderful buzzing and their help in pollination. 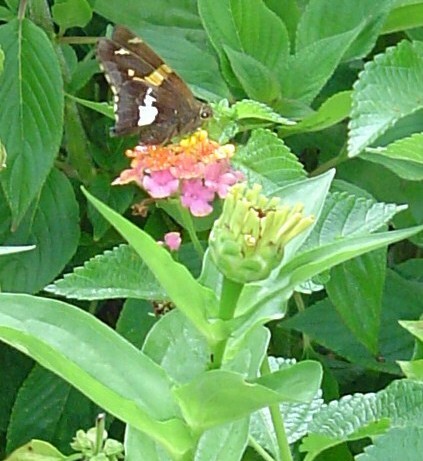 We have many different sorts of bees zooming around with the dragonflies, butterflies, and the humming birds. Here are a few who stayed still long enough for me to get their photos. 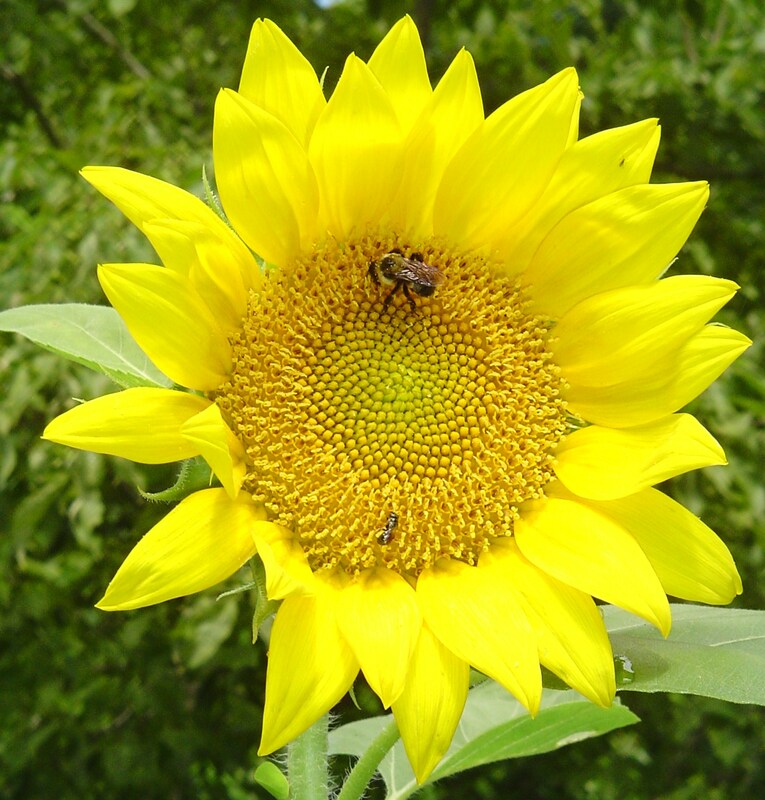 A volunteer sunflower, growing happily in a pot from last winter’s bird food, feeds a happy bee. A feast of Purple Coneflower, roses, Monarda, and Sage is laid out for all comers on a June morning. 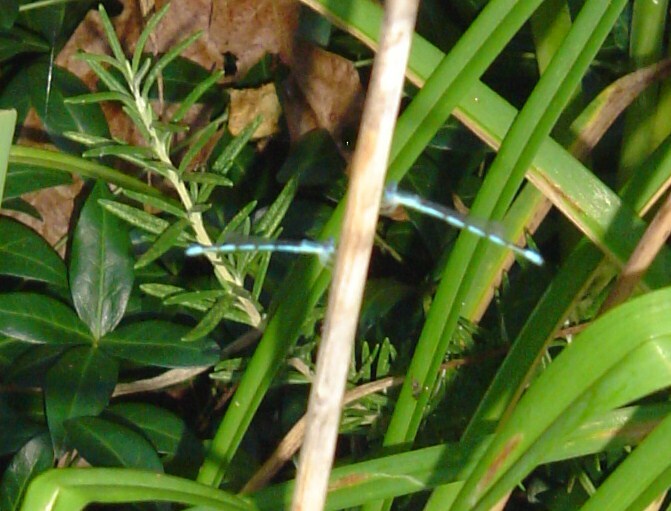 Two tiny blue dragonflies alight on this day lily stalk. The shrub “bones” of this garden are Rose of Sharon, butterfly bush (Buddleia), shrub roses, “Josee” re-blooming lilac (Syringa), and a fig tree. 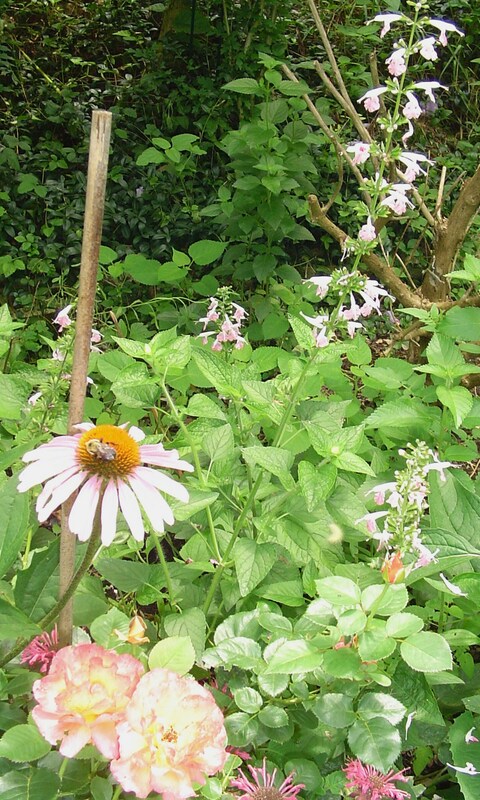 Perennials include Pineapple Sage, Mexican Blue Sage, culinary sage, Monarda, Purple Coneflowers, Daisy, Stachys Byzantina (lamb’s ears), Gaillardia, Oregano, Lavender, Rosemary, Comfrey, Geranium, Hosta, and spring flowering bulbs. 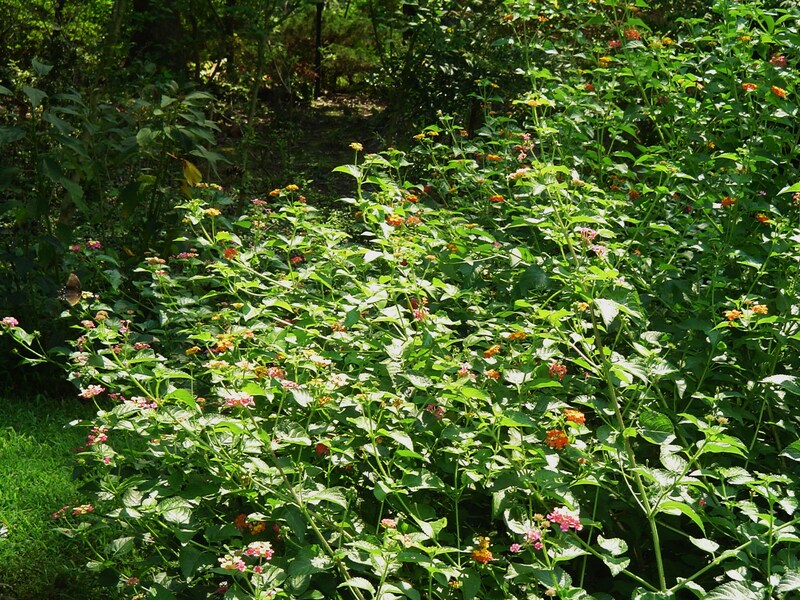 Annuals include Basil, Pentas, Zinnias, Nicotania, white Sage, Marigolds, and hot peppers. 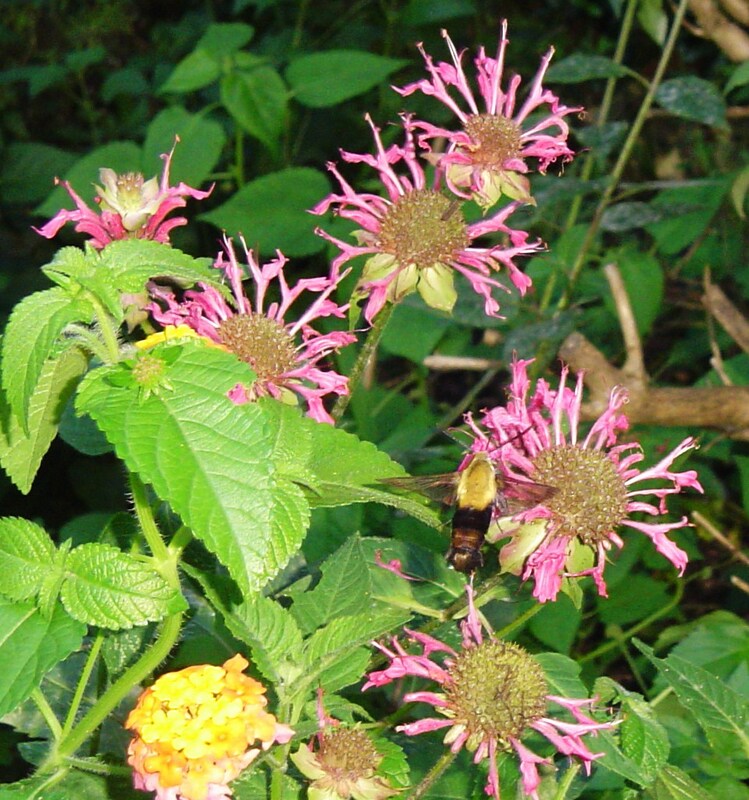 A Hummingbird moth enjoys feeding on Monarda, or Bee Balm. 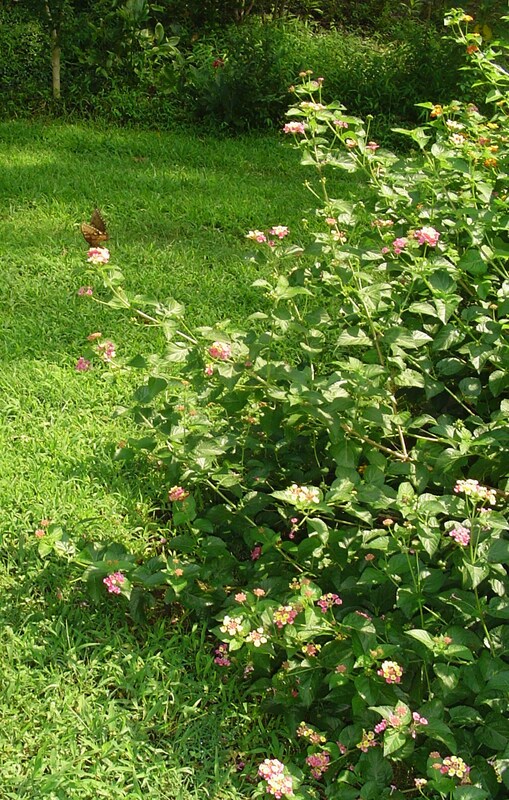 Monarda is a perennial herb in the mint family. 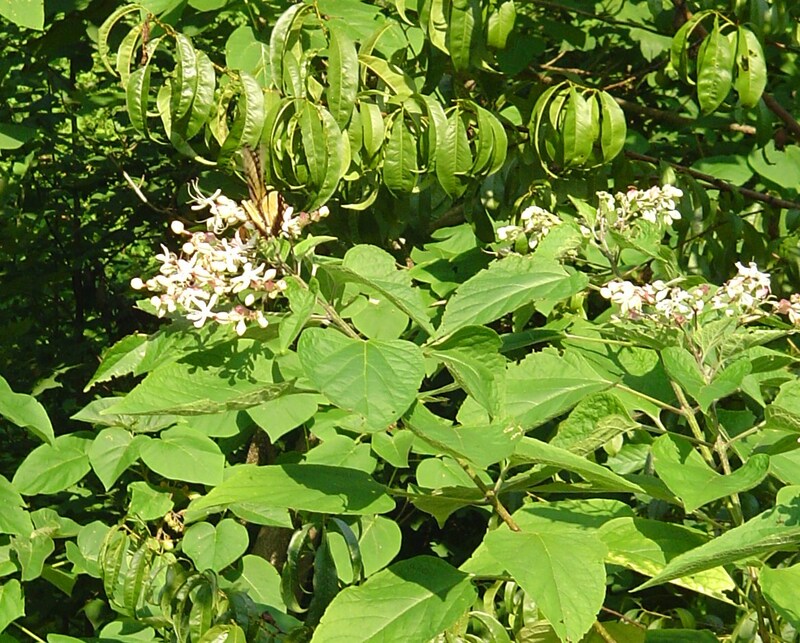 Its leaves can be dried and used as tea. 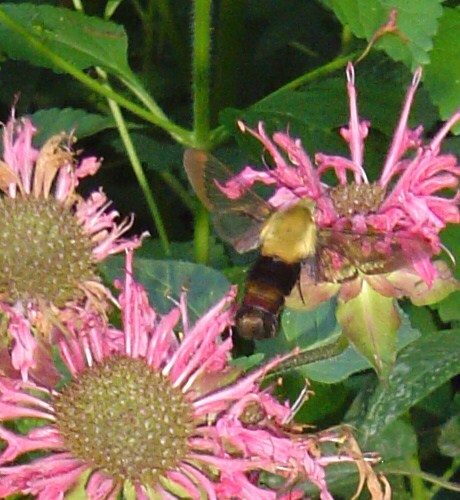 A hummingbird moth feeds on Monarda. 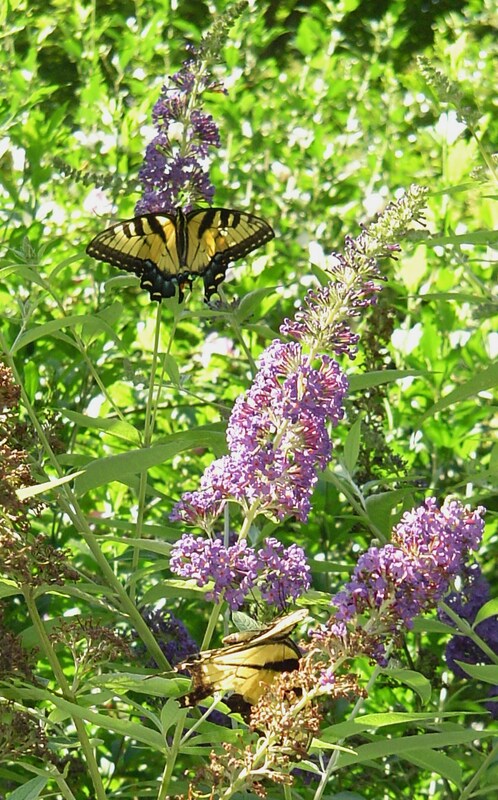 For more information on the Hummingbird Moth in Williamsburg VA, see the July article in the Virginia Gazette. “Josee” re-blooming lilac, in its second flush of bloom in late June, is appreciated by all the nectar lovers in the garden. 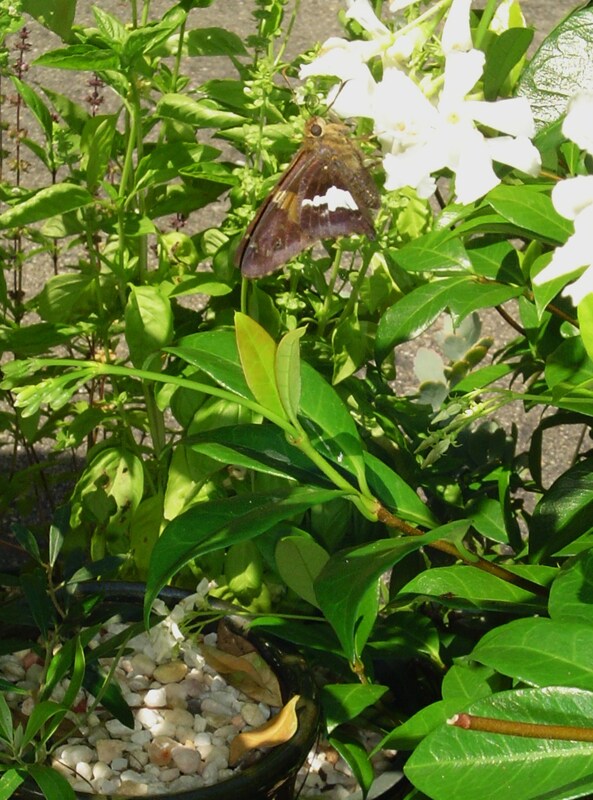 Please enlarge this photo to see the Hummingbird Moth feeding here. 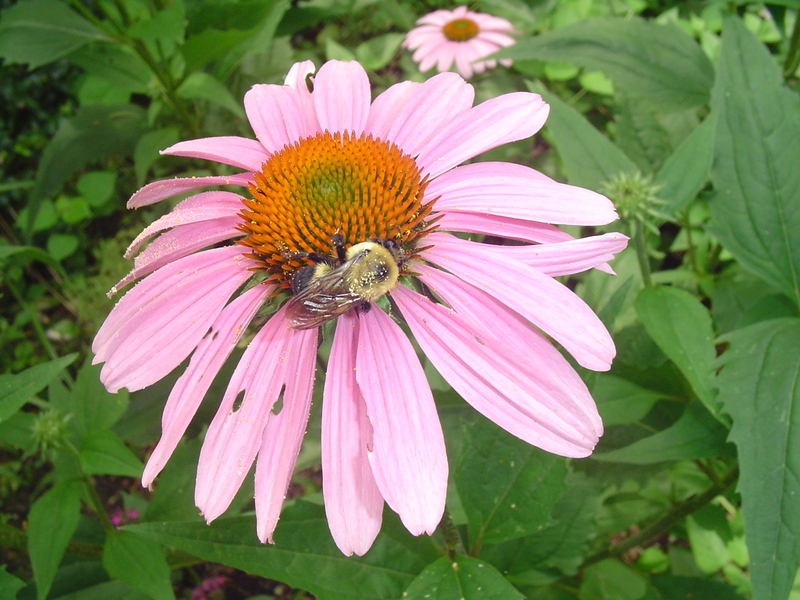 Bumble bees don’t have a hive. In the early morning you will often find them sleeping on the last plant they visited at dusk. Breakfast is already on the table. 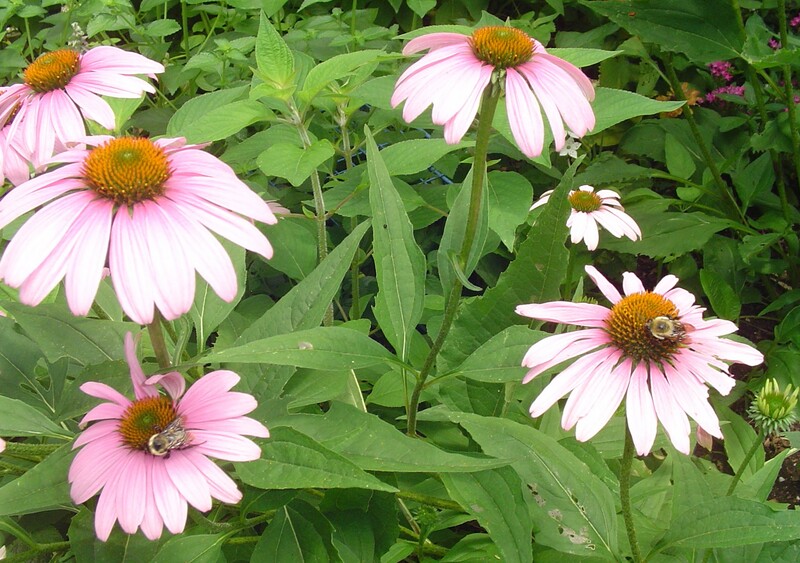 Bumble bees enjoy the Purple Coneflowers. Pineapple sage in the background will bloom by early autumn to continue the feast. 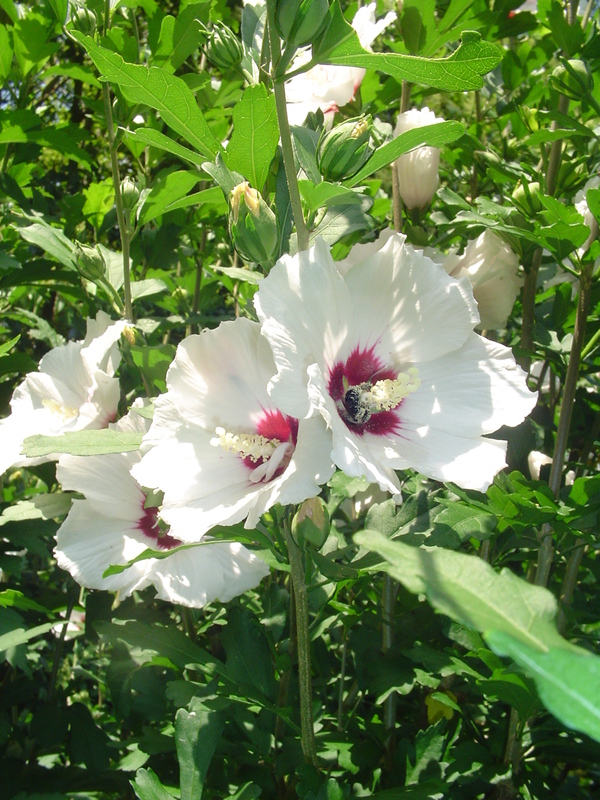 A bee covered in pollen from the generous Rose of Sharon, or tree Hibiscus flowers.